In this tutorial I'll show you how to create an abstract piece featuring a young Vietnamese woman in a traditional long dress. Long dresses, lotus, and bamboo are known as cultural symbols in Vietnam. First, we'll build the background using an old texture and some watercolor images. After that, we'll add the model and the lotus and bamboo branches. Later, we'll paint some light and add some splatter and bokeh. We'll use several adjustment layers to complete the final effect. Stay inspired! 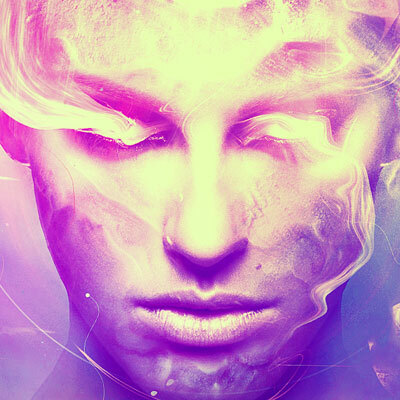 Create beautiful abstract portraits quickly with Photoshop Actions from GraphicRiver. Click the second icon at the bottom of the Layers panel to add a Mask to the texture layer. On this layer mask, activate the Brush Tool (B) and choose a Soft Round Brush with black color to paint on the left section near the middle of the canvas. It's to reveal the lightness to fit the light on the model (we'll see in the next section). Open the watercolor images pack. Choose the image named 1030 or one you like and place it on the canvas. Use the Free Transform Tool (Control-T) to make it fit the size of the background. Change this layer Blend Mode to Multiply 100%. Add a Mask to this layer and use a Soft Black Brush with a lowered Opacity (about 30-35%) to reduce the visibility of the watercolor effect. Choose the image numbered 1029 and place it in the right half of the canvas. Mask it off to show some cyan details only around the middle. Make a Hue/Saturation Adjustment Layer above this layer and set it as Clipping Mask. Adjust the Master and Cyans settings to change the color of the indicated cyan details. Add the watercolor 2 image to the middle section and set this layer Blend Mode to Multiply 50%. Use a Layer Mask to blend it with the existing background. Extract the model and add her to the middle of the background using the Move Tool (V). Use this brush to soften the bottom of the model and blend her with the canvas. Create a Hue/Saturation Adjustment Layer and change the Master, Reds and Magentas settings. The aim is to change the color of the long dress. Make a Curves Adjustment Layer to darken the front of the model a little. Paint on the back and the shadow areas of the model. Cut out the lotus and place it above the left shoulder of the model. Duplicate it four times and add the copies to the back, hair, and face. Use Control-T to change their size and direction. Add a Mask to the lotuses on the shoulder and face. Use a medium Soft Black Brush to blend the lotus with the shoulder and remove the front of the one on the face to show only two petals near the eye. Use a Color Balance Adjustment Layer to increase the red for the lotuses. Make a Curves Adjustment Layer to brighten the lotuses. Paint on the shadow areas so they won't be affected by this adjustment layer. Extract the bamboo branch and place it in anywhere on the canvas. Set this layer under the lotus group. Place this modified branch behind the biggest lotus. Use a Layer Mask to erase the top of this branch. Use this method to create more different twisted branches. Arrange them around the model, above the head, along the hair, and beside the cone. Use a Layer Mask if needed to blend the branches with the head or make them appear behind or in front of the model. Make a Group for the bamboo branches. Add a Color Balance Adjustment Layer to make the branches more yellow to match the existing background. Go back to the model layer and add a Mask to it. Use a medium Soft Black Brush with a very small size (2-3 px) to erase the space between the branches on the head. Make a New Layer on top of the layers and use a large Soft Brush with the color #251601 to paint on the model area. Change this layer's Blend Mode to Linear Dodge 100%. Duplicate this layer twice to strengthen the light effect. Use a Layer Mask to erase the light on the model's face to focus on the cone area only. On a New Layer, use a small Soft Brush with the color #d9ab53 to paint the lotus on the shoulder. Change this layer Blend Mode to Overlay 100%. Open splatter 1 image. It has a transparent background, so just use the Move Tool to place it under the lotuses behind the model. Double-click this layer, choose Color Overlay, and pick a green color similar to the color of the bamboo's branches (#8aa013). Duplicate this layer twice and resize them to be smaller. Move one rightward a bit and the other to the shoulder, and then use a Layer Mask on each of these layers to soften the lines of the splatters. Add more splatter under the big lotus behind the model and change the color to #df7877 to match the color of the lotus. Open the watercolor 2 image again and place it over the lotuses on the model's back. Scale it down and change this layer Blend Mode to Darken 100%. Use a Layer Mask to clean up the effect on the bigger lotus. Make a Hue/Saturation Adjustment Layer to change the effect's color to green. Use a Curves Adjustment Layer to decrease the effect's visibility. Open the splatter 2 image. Extract the splatter from the white background using the Magic Wand Tool (W). After that, use the Lasso Tool (L) to select the right part (or any parts you like—your choice) and add it to our main working file. Duplicate this layer and move the splatters to the head and the back of the model. Take the upper part of the splatter and place it in the cone area. Add a Mask to each of these layers and clean up the unwanted details. Make a Group for the splatter 2 layers and change their color to green using a Hue/Saturation Adjustment Layer. Create a New Layer on top of the layers. Change the Foreground Color to #809100 and use a watercolor brush to paint on top of the head. Add a Mask to this layer and use a smaller watercolor brush with settings like our previous ones to make a defined effect. Place the bokeh image over the lotuses on the model's back. Change this layer Blend Mode to Overlay 100% and use a Layer Mask to clean up the hard edges and make some bokeh visible on the lotuses. Select different parts of the bokeh image to add to the cone area, the head, and the back. Apply Masking on each of these layers to show some light and bokeh. Create a Curves Adjustment Layer to strengthen the effect and light. Create a Gradient Map Adjustment Layer on top of the layers and pick the colors #e10019 and #ae730c. Lower the Opacity of this layer to 20%.